For whatever position he has been played at, David Alaba has been largely solid, if not, outstanding at all of them. The 25-year old has gained a reputation as one of the smartest players of his generation, a player with incredible positional sense. In that regard, he can be compared to his full-back teammate, Joshua Kimmich. But, arguably, his positional versatility exceeds his young Bayern Munich peer. And it is easy to see why by just naming off the various positions he’s played for at different teams. At Austria Wien, he was a playmaking central midfielder, the same role he plays with the Austrian national team. At Hoffenheim, he was used as a deeper-lying midfielder and at Bayern, especially under Pep Guardiola; he was used as a centre-back plenty of times. But is that truly his best position? For some, it is not. With all this mind, there’s little doubt amongst all his teammates and coaches, current and former, that Alaba has excelled at every position and is a difference maker at all of them. Should Alaba leave Bayern anytime soon (I doubt it) there’s a good chance he could be played as a No 10, box-to-box, or defensive midfielder. I mean, we also can’t forget that he takes the occasional free-kick at Bayern. However, given the fact that he has spent most of this season at left-back, we’ll be focusing on this position while briefly looking at some phases of play in other roles as well. But before that, let’s take a very brief look at the current system Alaba plays in at Bayern under new manager, Jupp Heynckes. Under Heynckes, Bayern plays a 4-3-3 based on possession/positional- play in attack and defend (when they don’t high or counter-press) in a block of either 4-2-3-1 or 4-4-1-1 with two defensive midfielders (almost always) in front of the back four. Similarly to his full-back counterpart Joshua Kimmich, Alaba is expected to get involved heavily in attacking and build-up phases by occupying his left-wing or half-space (usually). He usually does this by using his pace, technique, and crossing ability to support, playoff his midfield and winger; he’s usually partnered on the left with Franck Ribery, or penetrate the opposition penalty area. However, during defensive block phases of play, the Austrian is required close down time and space quickly down his flank by pressing on opposing forwards, wingers, etc. Given that Bayern do press, and are triggered by backward opposition passes, Alaba has to be ready to press high up and join the pressing effort if the ball is on or near his side to anticipate a pass to his nearest marker or to push someone back. With his basic positioning in mind, let’s also take a look at his heat map. Above, we can see that Alaba mostly operates on the left in the attacking-half of the pitch. This shouldn’t come as a shock given the fact that it is usually Bayern who dominate possession. 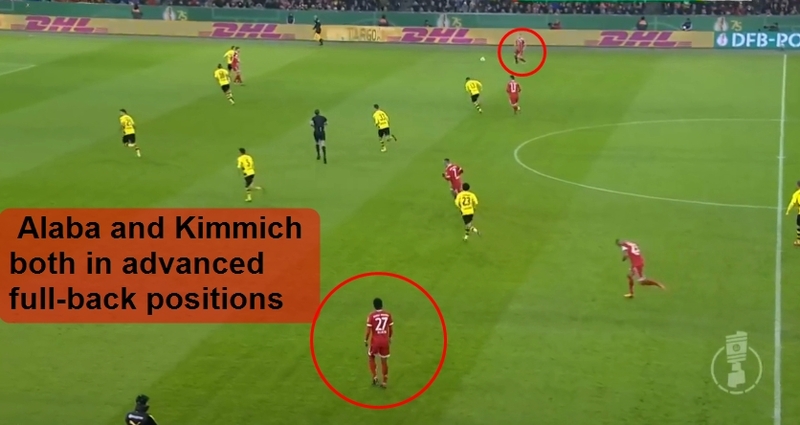 His positioning aside, Bayern usually deploys a man-orientated press that changes in structure depending on the opponent (as with many top sides in Europe). They either use a 4-3-3 man-orientated press, as seen below or a 4-1-4-1 high-press. They’ll also, however, use a 3-2-3-2 press against certain opposition or if the opportunity arises where that shape is better. Footballers are trained to react to certain patterns of play by the opposition, especially in high-pressing phases. 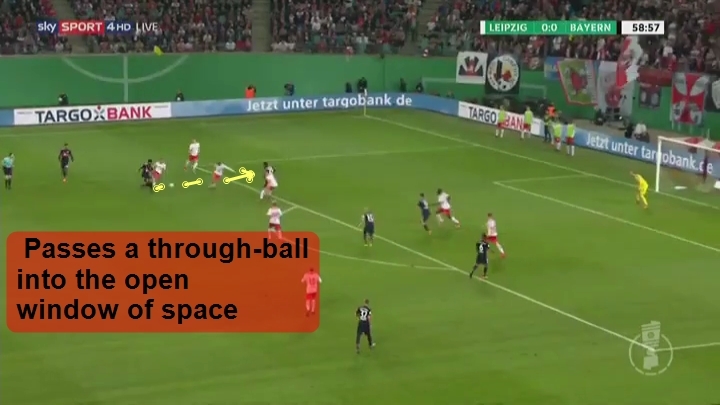 In correlation to Bayern’s pressing, Alaba is required to close down time and space on any potential threats, and near passing lanes, if the ball is on or near his left side. However, if the ball is not on his side, he’s supposed to stay close to his two center-backs. But what about Alaba’s positioning in attack? Well, below, we can see Bayern’s positional fluidity through Alaba’s forward-like positioning. Bayern were pushed back, but James Rodriguez drops deeper, feeds a pass to the Austrian, who maintained his forward position as he was already there when the play was pushed back. It made sense for James to occupy his left-back role and for Alaba to stay up. Good shape is good shape. As with any positional-play inclined side, understanding the attacking structure in correlation with how your opponent is defending is crucial. It made sense for James and Alaba to swap positions. Now, as for build-up phases, Die Bayern like to push both full-backs high, at times, to give themselves two consistent options for switching the play to the under-loaded side. Above, we can see both Kimmich and Alaba (red circles) in higher positions at the same time. They have very similar roles as they are both highly technical players who possess a keen sense for penetrating the opposition’s penalty box in attacking phases. With the system briefly explained and the basics of Alaba’s positioning understood, let’s get into his detailed characteristics. 4. Defensive positioning and pace. Now, let’s get into the good stuff. Don’t forget to read the annotated text within the screenshots! What makes the 25-year old such a threat in attack is that he can make key passes from short-to-long ranges. 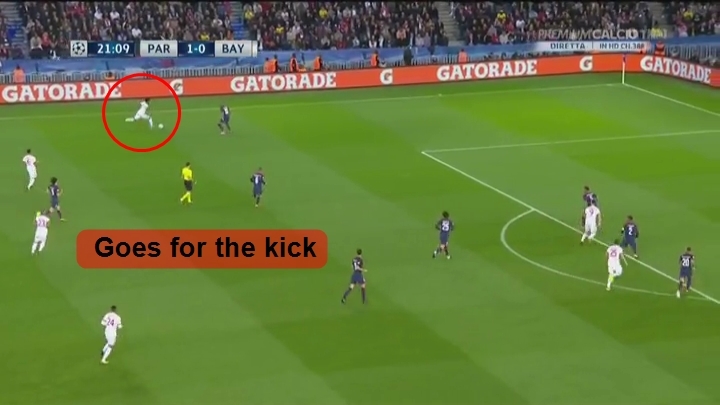 As a result, and given his long-range accuracy, he takes Bayern’s left-sided corner kicks. Below, is a corner kick scenario in which he demonstrates his accurate long balls. Alaba has an incredible ability to find his teammates directly or catch their head or feet in stride. These next two crossing phases will continue to show Alaba’s incredible ability to cross into the box. As illustrated above, Alaba is always aware where his teammates are just prior to firing off his crosses. Next, we’ll see another crossing scenario. However, it shows his long passing range from an even greater distance. His confidence is clearly evident in the sequence above. Alaba is a player that knows his passing range is of a high accuracy and is not afraid to use it frequently. This next phase illustrates Alaba’s awareness when cutting inside toward central areas. It’s a good play that shows his qualities of a No. 10. As we can see above, the Austrian finds the open window of space to lay on a through-ball for Kingsley Coman into the opposition’s penalty area. In addition to his great passing range, he’s a great creator with excellent vision. In addition to left-back, Alaba’s long-range accuracy can be dangerous from a center-back position as well. As many of you may know, sometimes when in possession the center-back that is the open option on the switch of play can have plenty of time to pick out his intended target. The play below shows Alaba doing just that. First off, that distance in itself is massive and the accuracy is perfectly in stride to Thomas Muller’s foot. Secondly, the play above shows just how effective Alaba is from a center-back position as well. In terms of off-the-ball movements, what a player does away from the ball is very important and can sometimes be the difference between a wasted chance and a goal. In the next play, we see Alaba making a late run into the window of space between FC Koln’s RCB and RWB. Obviously, the window left open for Alaba is a horrible error on behalf of the opposition defense, but Alaba still shows that even at left-back he’s willing to think like a forward and get in good goal scoring positions. Now, let’s get into defending. So, as with almost any defensive action in your own penalty area, the ability to be in the right position in accordance to your threats and clear away danger is a huge skill that every center-back must learn. In the next two phases, we’ll see just that. What I love most about this play is that the moment Alaba initially fails at his first clearance attempt, he immediately gets up and doesn’t give up on the play. He sprints toward his own goal and gets in a great position to clear that shot away. The clearance play above is a bit different because Alaba had more help surrounding him but also had to consider two threats in front of goal instead of just one. He got himself between the net and potential passing lane and did a fine job of clearing based on position and reflexes. Given that one of Alaba’s few individual weaknesses is his aerial ability, it’s good that he can make up for it via his pace and intelligence. 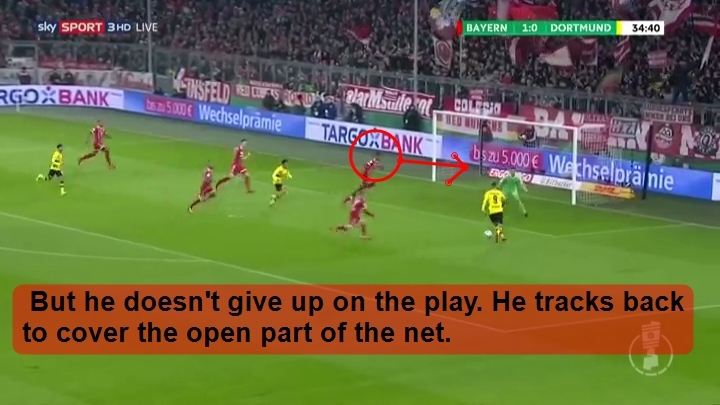 The play below shows how he deals with a long-ball that is about to get behind Bayern’s defense. He uses his pace and active footwork for the tackle to break up the scoring chance against. Every scout knows that pace can sometimes make up for slightly slower reactions toward different actions on the pitch. This is a huge advantage for Alaba. This next phase is special because it shows when Alaba recognizes that he can’t win the ball in the air and chooses his defensive positioning via his pace to get in a good position to stop the scoring chance against. As seen above, Alaba opting to run ahead of his marker rather than going for a heading clearance was the right decision. As a defender or any player for that matter, it is good to know what your weaknesses are and how to adjust and make up for them in other ways. Alaba often flies under the radar as opposed to some of the other left-backs in the game, but, to me, he is the most complete; truly complete. His positional sense is unrivaled and he’s undoubtedly one of the most gifted and smartest players in the game. The phases of play above illustrate just that. It’ll be interesting to see what other areas improve when Alaba reaches his prime. Full-back is arguably the most physically and tactically demanding position in modern football, and it’s a pleasure to watch this young man play. I advise everyone reading this to isolate him if you’re ever watching the Bavarian giants. You won’t be disappointed.